German physician and political writer; born at Königsberg Aug. 20, 1820; died there Aug. 31, 1900. He was educated at the universities of Königsberg, Berlin, and Halle, graduating from the first-named as M.D. in 1843. 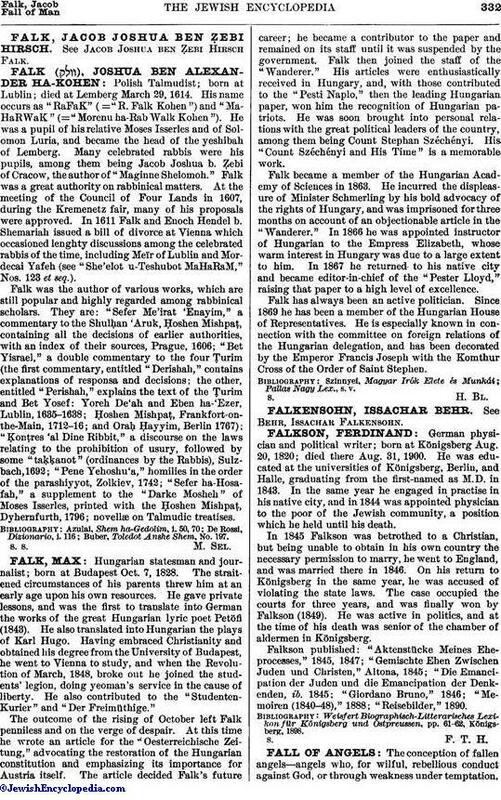 In the same year he engaged in practise in his native city, and in 1844 was appointed physician to the poor of the Jewish community, a position which he held until his death. In 1845 Falkson was betrothed to a Christian, but being unable to obtain in his own country the necessary permission to marry, he went to England, and was married there in 1846. On his return to Königsberg in the same year, he was accused of violating the state laws. The case occupied the courts for three years, and was finally won by Falkson (1849). He was active in politics, and at the time of his death was senior of the chamber of aldermen in Königsberg. Falkson published: "Aktenstücke Meines Eheprocesses," 1845, 1847; "Gemischte Ehen Zwischen Juden und Christen," Altona, 1845; "Die Emancipation der Juden und die Emancipation der Denkenden, ib. 1845; "Giordano Bruno," 1846; "Memoiren (1840-48)," 1888; "Reisebilder," 1890. Weisfert Biographisch-Litterarisches Lexikon für Königsberg und Ostpreussen, pp. 61-62, Königsberg, 1898.